When draft day arrives, all the owners in a fantasy football league gather at a central location or log into the specified web service’s draft utility and meet virtually. The goal for each owner is to draft a team roster of 15 to 18 players. How many players to draft at each position is up to you, but the traditional combination of players to draft: two quarterbacks, four running backs, four wide receivers, two tight ends, two kickers, and two defense/special teams (punt and kickoff return) units. Each owner selects one player at a time. Generally, the online service randomly chooses the order or, if drafting offline, the commissioner draws numbers out of a hat to determine the draft order. The owners make their picks in order for the first round. Then they reverse this order for the second round, what’s called a snake draft. For example, in an eight-person league, Owners 1 through 8 make the first eight selections in order, completing the first round. Then as the second round starts Owner 8 gets the ninth pick, Owner 7 gets the tenth pick, and so on down to Owner 1, who makes the sixteenth and seventeenth picks, and so on until all owners fill their rosters. Before the draft, designate two people to record all the player selections. Accurate records can help resolve conflicts that may arise later. 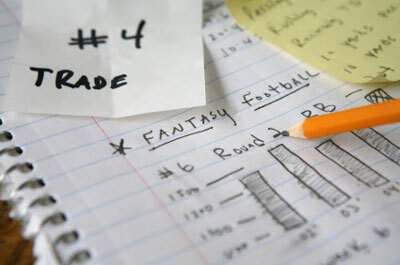 Alternatively, your fantasy football rosters can be updated online, in Excel charts, or even on a community draft board. A draft board can help every owner see each person’s team as it’s being selected, which is extremely useful for live drafts. They replace poor-performing starters: If your quarterback, for example, plays poorly, you can replace him in your starting lineup the following week with your backup quarterback. They replace injured starters: If your star running back breaks his leg (gasp! ), you simply start your backup running back the following week. They replace players on bye weeks: Each NFL team has one bye week. Because of bye weeks, you need to insert backup players for your starters whose teams aren’t playing that week. It’s important to choose all your drafts carefully in fantasy football, including your reserves. Although reserve players’ statistics don’t count while the players sit on your reserve squad, they are important because they replace poor-performing starters, they replace injured starters, and they replace players on bye weeks. Maintaining a strong fantasy football team roster filled with potential stars, role players, and backups is critical to performing well throughout the whole season.